I love Eydie Gorme. I mentioned in a previous post that I grew up listening to her "Amor" and "Mas Amor" albums, so that's how I was exposed to her wonderful voice and songs. Those were the only two of her albums that my mom had, so I had never listened to "Eydie in Love" until I bought this album. And, once again, it was the cover that caught my attention - I love the expression on Eydie's face! One should be so lucky to feel whatever she's feeling in that picture! Well, this album does not disappoint. 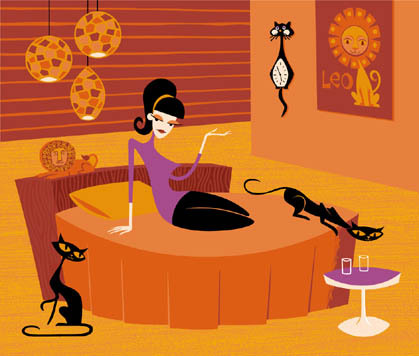 Eydie sings some wonderful pop standards and brings her own style of warmth and feeling to these songs. It's simply delightful! I was able to remove most of the clicks and pops, but you can still hear some, and there's a skip in a couple of the songs, but none that will detract from the overall performance. I hope you enjoy this album as much as I do! Here's a treat for you polka lovers! 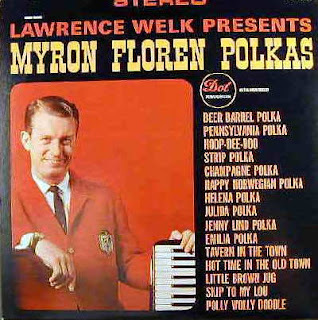 I couldn't resist buying this album when I saw it because I grew up with "The Lawrence Welk Show" and loved Myron Floren. I remember watching the show with my parents and aunt every Saturday evening (the only other option was "Hee Haw" and we definitely were NOT a "Hee Haw" type of family) when I was a little kid in the 1960s and early 1970s. Myron was one of my favorite performers on the show, along with Bobby and Cissy (my very favorites), and the guy with the great tenor voice. My younger cousins, Abel and Sammy, also grew up with the show, and we used to play that we were on "The Lawrence Welk Show". Now, how many of you can say that you used to do that??? I would be Lawrence Welk (after all, I was the oldest and therefore, the boss), and then I would be several of the girl singers (mostly Ana Cani, because she was from Mexico). Abel and Sammy would be the various guy singers, but Abel would be Bobby to my Cissy (Sammy was the youngest and the shortest at the time - he's the tallest now). But the best performer of all that we all wanted to be was Arthur Duncan, the tap dancer. He completely wowed us! I remember we would dance ourselves into complete exhaustion trying to imitate him (none of us knew how to tap dance). Who knew that pretending to be on "The Lawrence Welk Show" could be so much fun? Years later (in the 1980s), my mother got to see Myron Floren at some festival back home. The venue was packed with all the other senior citizens that had arrived before her, so she watched the show from outside one of the windows of the place. She didn't mind - she loved it. After all, it was Myron Floren! So, there's my trip down memory lane. Back to this album... There are some really fun polkas on this album and you'll recognize most of the tunes. You may even want to play this at your next polka party! After listening to this (and getting my aerobic workout by dancing around the room to it - and scaring my cats), I think that I'll have a polka party after I move into my new house! "Paging Dr. Joe Gannon! Paging Dr. Joe Gannon!" How many of you watched Chad Everett starring as "Dr. Joe Gannon" on the television series "Medical Center" back in the 1970s? I used to love that show! (Does anybody know if and when this is coming out on DVD?) 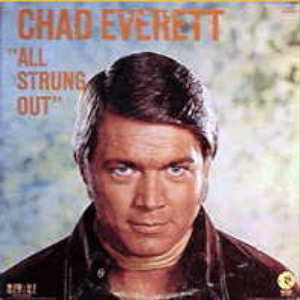 And Chad Everett was the grooviest doctor ever! James Brolin was cool as the motorcycle-riding "Dr. Steve Kiley" on "Marcus Welby", but Chad Everett was G-R-O-O-V-Y! Remember the mod clothes he wore? I remember one episode where he was wearing these groovy furry boots - he definitely brought some style to doctors' wardrobes! And that hair - never a hair out of place! Even now when I see him in some commercial for insurance (or something like that), he still has that perfect hair (silver now) and is still a good-looking man. Sigh. Well, our man Chad also recorded a couple of record albums back during his "Dr. Joe Gannon" days - and I have both of them! Many of you know how I have a particular fondness for celebrity vocal albums, and my Chad albums are two of my favorites. "All Strung Out" is his debut album and contains some familiar songs as well as some I've never heard of before. My favorite is "Hey Girl" (although my favorite version of this song is by a young Donny Osmond - before his voice changed). An interesting bit of trivia about this album is that it was produced by Nino Tempo (of Nino and April fame). Nino also arranged several of the songs and played the sax solo on "Hey Girl". Oh, and "All Strung Out" was first recorded by Nino and April in the 1960s. So, here's groovy Dr. Joe Gannon crooning some tunes! Enjoy! 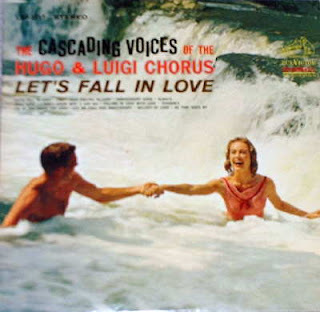 With the fresh style of the Hugo & Luigi Chorus caressing the senses, it's easy to follow the suggestion of the title song, Let's Fall in Love. Listen with a partner. Wonderful things may happen. Is this a crazy cover or what?! I love it! Needless to say, when I saw this cover, I just had to buy this record - I didn't care who it was by or if I liked any of the songs. I mean, just look at this cover! Who comes up with some of these cover art ideas anyway? Well, this is one I'll be framing and hanging up on the wall of my new house (I'm in the process of buying a groovy mid-century modern house - I'll post pictures of it in a later post). And I just love the title of the album, too! The music itself is pretty good - I'd say this is an album to add to your lounge collection. I did my best to clean this one up, but you will still hear some clicks and pops, plus a couple of the songs have some minor skips. swiftly now, cross over the BRIGETTE. her madness ... HER MUSIC. Here's a fabulous album filled with inventive portraits of the many moods of love, from a chance flirtation to moments of ecstasy. The melodies are sophisticated and dramatic, just the kind the world expects from one of its most popular composers, Les Baxter. He's adorned each theme with a provocative title, inviting your imagination to dream along with him. Les' thrilling orchestrations sparkle with fire in these richly romantic tributes to the universal emotions of love. Well, I couldn't have said it better myself than those liner notes above! This is yet another gem from the HPB bargain bin, and the first thing that caught my eye was the cover - the girl certainly looks, er, uh, happy! Well, one listen to this album and you'll understand why she's happy - as usual, Les Baxter does not disappoint. This album is great! I'm not going to go into detail about Les Baxter, because most of you are very familiar with this musical god of exotica. So, just go to Space Age Pop and read a great bio about him there. Happy New Year! I hope everyone had a wonderful holiday season and that 2008 is the best year yet! This album by Steve Allen is starting off a new year of musical postings. It's called "Steve Allen Plays Bossa Nova Jazz" and is really cool! I do love bossa nova, although I was very small when it became the rage and don't remember ever listening to it until I became an adult. I've also wanted to learn to dance the bossa nova, but it wasn't offered at the various dance studios where I spent seven years learning ballroom dancing in the late 1980s and early 1990s. (If anyone out there knows of a video or something that teaches how to dance the bossa nova, please let me know!) Anyway, I really dig this album and it's perfect for cocktail parties or dinner parties. I posted another Steve Allen record last year (I love saying that when "last year" was only a few days ago), but I think I like this one better. You can read about the multi-talented Mr. Allen on Space Age Pop, where there's quite a detailed bio on him.